SCVHistory.com DI2810 | St. Francis Dam Disaster | Power House No. 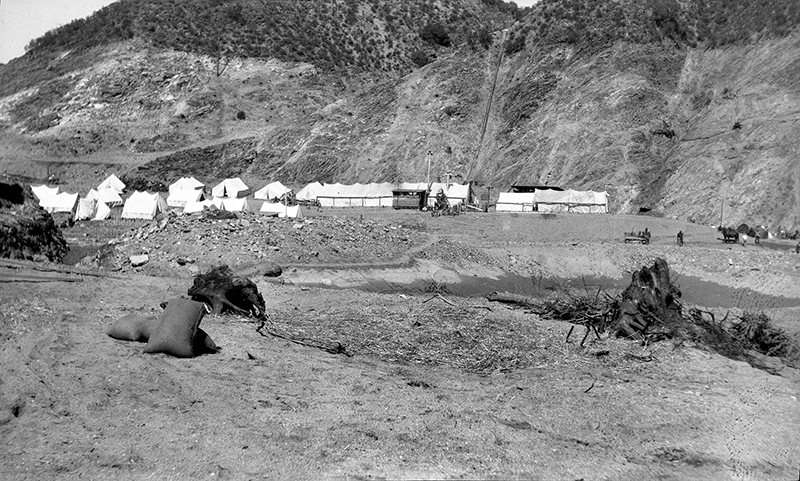 2 Reconstruction: Construction Camp, 1928. Workers from the L.A. City Bureau of Power and Light (DWP predecessor) Construction Division set up camp on the north side of Power House No. 2, which would be just out of frame to the right. The power plant washed away in the flood of March 12-13, 1928, leaving only the generators behind. This photo shows the proximity of the camp. DI2810: 9600 dpi jpeg from original 4x6-inch transparency purchased 2015 by Sharon Divis.